Space, time and meaning cascade over one another in bewildering fashion in writer-director Oliver Laxe’s second feature Mimosas. It’s a mesmerising, mercurial film in which an arduous undertaking takes on personal, spiritual significance as well as physical form. 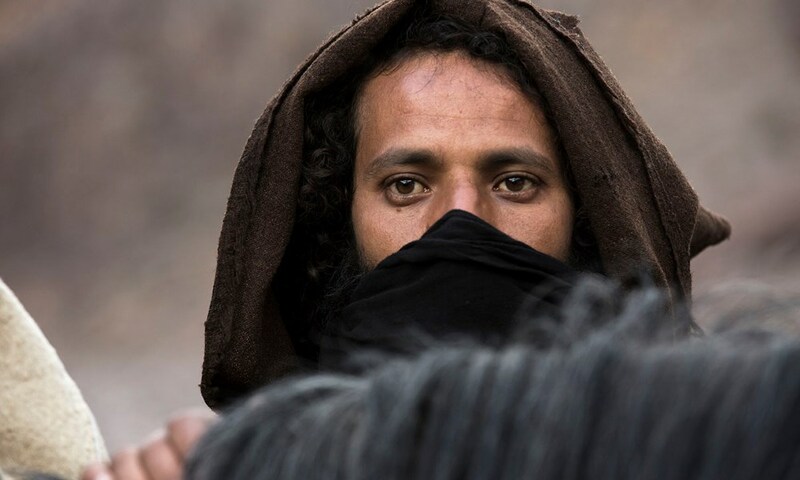 The Spanish filmmaker sets this thought-provoking quest of faith and self-affirmation in his now home country of Morocco. Beginning in an uncertain but distant past, two men of a party of many consider robbing the rich, ailing sheikh they are accompanying to the land of his ancestors where he wishes to pass away and be buried among them. However, as others fall away due to the rugged, unforgiving terrain, and upon his death before their objective is attained, Ahmed and Said vow to transport his body to its final resting place. Elsewhere, in a bustling, contemporary town square men argue and complain about taxi shifts doled out by a foreman. Shakib, a character somewhere between a court jester and prophet, is assigned the special task of assisting the caravan of travellers to its destination. It is from the marketplace that a fleet of cars take off into the dusty dusk and the one carrying Shakib arrives in the past like a mythic DeLorean. The gruelling trek on which they travel may take them a long way east but there are certain echoes of the Western genre here. How genre and the temporal periods overlap and interrelate is elusive and unclear but although this is a project of jarring contradictions, they somehow in no way interrupt the ebb and flow of the narrative. Adding a realist element to a film which appears to be anything but, actors Ahmed Hammoud, Shakib Ben Omar and Said Aagli retain their own first names; the loneliness and breathtaking isolation of the remote mountainous setting is captured in panoramic vistas by cinematographer Mauro Herce with almost documentary-style objectivity; and a three-chapter structure, named after Sufi prayer positions, lends a loose framework rather at odds with the free-flowing journey. This odyssey is as much in the minds of these weary travellers as across the vast plains and remote mountain passes they must traverse. It is hard to put a finger on the sense of ease we feel at being a little lost in this world, but just as Shakib reassures his fellow travellers, “If you do it well, I will do it better,” if we invest some of ourselves into this story, we find Laxe’s inscrutable vision to be composed, intriguing. Comparisons could certainly made to Miguel Gomes’ enchanting three-volume epic Arabian Nights. It sounds trite to say that the figures onscreen must lose their way in order to find themselves – and there is no such sense of cliché in the director’s handling of his material – but the experience is similar for a viewer. The film’s very first image, which remains framed in either long shot or close up throughout the opening credits and which resonates throughout, is of an ancient city, vast fields, mountains and sky painted on a wall. In the centre of this crumbling mural is a closed door. And perhaps this is the essence of Mimosas; that self-discovery comes through experience, through daring, through pushing through to see what lies behind.